Bred for loyalty, strength and endurance, the easy-going and sociable Siberian Husky is a very pure and ancient breed, dating back 4,000 years or more. First bred by the Chukchis, a semi-nomadic people of northeastern Siberia, to hunt reindeer and pull sleds, the Siberian is an active breed that loves the outdoors. Prized for their great beauty, intelligence, wonderful way with children and lack of “dog smell,” they are also more free-spirited (and free-ranging) than many other popular breeds, and have a reputation for stubbornness and relentlessness in pursuit of a goal.Is this breed right for you and your family? 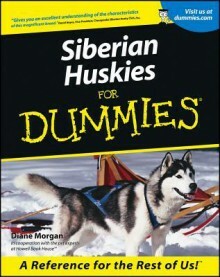 Siberian Huskies For Dummies answers this and all your questions about getting, caring for and living with a Husky. Siberian devotee—she has eight of her own—Diane Morgan gets you up and running with what you need to know to:Find and deal with reputable breedersChoose the right Husky for youHou sebreak and socialize your new puppyEducate yourself and your dogHandle behavioral problemsParticipate in competitionsIn friendly, down-to-earth language, Diane provides insights into the Siberian Husky temperament and loads of sensible, easy-to-follow advice on everything a Husky owner should know—along with fun facts and Husky trivia, amusing and informative anecdotes, and tips on how to have a great time with your Husky. Topics covered include:Understanding what makes the Siberian different from every other breedDeciding whether a male or female is right for youUnderstanding how to communicate with your Siberian HuskyTraining your Siberian HuskyGrooming your SiberianFinding and establishing a good relationship with a veterinarianBreaking bad habits in your HuskyFeeding and exercising your Siberian HuskyRecognizing, preventing and treating common health problemsGetting your Husky into sleddingThe indispensable guide for you and your Siberian Husky, Siberian Huskies For Dummies is the only book you’ll need to help you have the best possible experience with this very ancient and venerable breed of dog.